According to the biblical book named after her, Esther was a beautiful young Jewish woman who caught the eye of the Persian King Ahasuerus, became queen, and with the assistance of her cousin Mordecai, saved Jews throughout the Persian Empire from annihilation. Every year, on the holiday of Purim, Jews around the world celebrate this miraculous salvation by reading the Book of Esther, dressing in costumes, and eating delicacies. Iranian Jews similarly mark the holiday, but for centuries have also made a pilgrimage–throughout the year, but especially on Purim — to a shrine in the city of Hamadan where, according to tradition, Esther and Mordecai are buried. The origins and contents of this shrine are cloaked in legend and mystery. Hamadan, known in antiquity as Ecbatana, is in the Kurdish region of Iran. Mount Alvand, which overlooks the city proper, hosted the summer residence of Persian royalty of the Achaemenid Empire (the period when the Purim story is believed to have happened). Tradition has it that Esther and Mordecai — after spending their final years at the royal resort — were buried in the city, next to one another, with a shrine constructed over their graves. While the original shrine’s date of construction is unknown, its date of destruction, at the hands of Mongol invaders, purportedly occurred in the 14th century. Historian Ernst Herzfeld contends that the current structure may actually belong to Shushan Dokht, the Jewish queen of King Yazdagerd I (ca. 399-420 CE), who is credited with securing permission for Jews to live in Hamadan. Herzfeld dates the current structure to 1602 CE, partly on account of its traditional Persian architectural style (known as Emamzadeh), which was ubiquitous amongst the shrines of Muslim religious leaders built in that era. In most cases, these buildings include an entry hall and a main square hall with a domed ceiling that surrounds the sarcophagus (stone coffin). For centuries, Iranian Jews, Muslims, and Christians, particularly women praying for fertility, venerated the modest brick shrine. The first detailed accounts in the historical record are from Christian tourists in the 1800s and early 1900s. These records, which include outstanding illustrations, descriptions, and even photographs, were recently digitized–and provide a rare glimpse into the condition of the shrine in the past and the particular observances once held there. One 19th-century visitor describes a marble plaque on the interior dome walls claiming that the structure was dedicated in the year 714 CE by “the two benevolent brothers Elias and Samuel, sons of Ismail Kachan.” Other visitors describe rooms covered in pilgrims’ graffiti in various languages as well as darkened by candle smoke; a stork’s nest sitting atop the shrine’s dome; and a prayer area within that was designed to enable worshippers to face the tombs and Jerusalem at same time. They also recount that notes in Hebrew script were placed near the tombs, similar to how Jewish worshippers often tuck prayer notes into the stones of Jerusalem’s Western Wall. For Iranian Jews, who could reach Jerusalem only with great difficulty, the shrine served as a stand-in place at which to pray and weep. 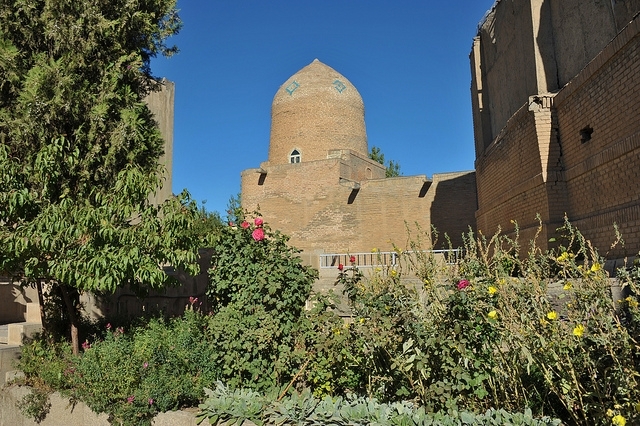 Until the 1970s, the shrine was hidden away in a crowded part of Hamadan, surrounded by houses, and accessible only through a narrow dirt alley. But in 1971, in honor of a national celebration of 2,500 years of Iranian monarchy, the Iranian Jewish Society commissioned architect Yassi (Elias) Gabbay to undertake a renovation. Houses around the tomb were purchased and demolished, making the shrine accessible from the main street via a bridge Gabbay constructed over the new courtyard and a partially-underground synagogue chapel he also built, to complete the shrine complex. The subterranean chapel has a skylight in the shape of a Star of David that can be seen in Google Earth, quite possible making the Islamic Republic in Iran home to the only Jewish star visible from space. One of the old structure’s remarkable features that Gabbay preserved is its front door, a massive piece of granite with a hidden lock. Less than four feet high, the stunted doorframe forces visitors to bow as they enter, in deference to the site’s holy occupants. An outer chamber holds tombs of famous rabbis and provides access by means of an archway to the interior chamber. The interior chamber features Hebrew writing along the walls and holds two carved sarcophagi, supposedly marking the burial spots of Esther and Mordecai. This chamber also houses a cabinet with a 300-year-old Torah scroll. Today, Esther’s Tomb has lost some of its former splendor. Iranian authorities, for example, have removed an ornamented gate Gabbay had erected along the sidewalk using a geometric motif common in many mosques. The problem? Part of the classic motif forms a Jewish star — a fact regime officials apparently considered intolerable (unlike the fence, the Star of David skylight is not visible from street level). Gabbay himself lives in exile, having fled after the Islamic Revolution and restarted his architectural practice in Los Angeles, though he dreams of returning to see the site he transformed. This article is dedicated to Sylvia Guberman ZT”L, a woman of valor in the spirit of Esther. Diarna, “Our Homes” in Judeo-Arabic, is a project dedicated to digitally preserving Mizrahi (“Eastern”) Jewish history through the lens of physical location. Satellite imagery, photographs, videos, oral histories, panoramas, and even three-dimensional models, offer a unique digital window onto sites and communities disappearing before our very eyes. To begin your free trip — no passport or airfare required — explore Diarna’s website (http://www.diarna.org). Diarna wishes to thank Iranian-Jewish scholar Orly R. Rahimiyan for her careful and helpful reading of this article in draft form. A public relations piece for Jews?